Okay you guys. I wish I could submit smells over the Internet. Like really. This bread made my whole house smell GLORIOUS. That roasted garlic!! There is nothing like it! 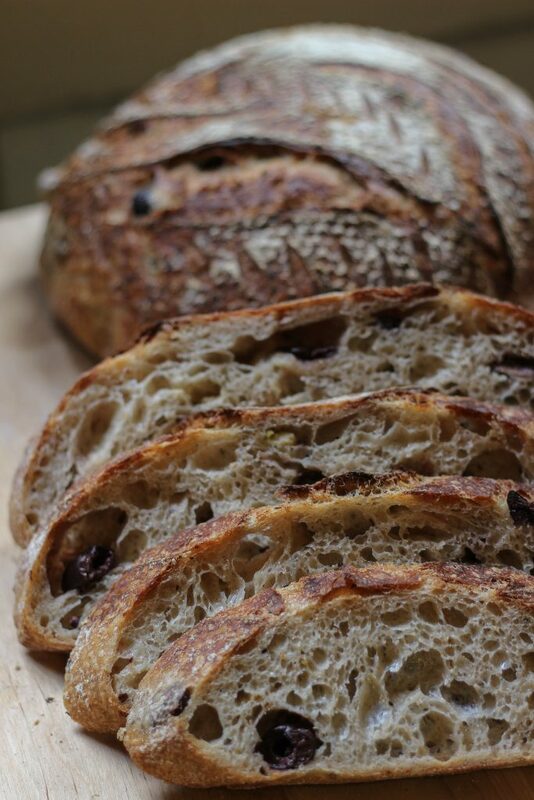 Mixed with the delightfully sweet and sour wild yeasty wheaty sourdough (try saying that five times fast! :-P). 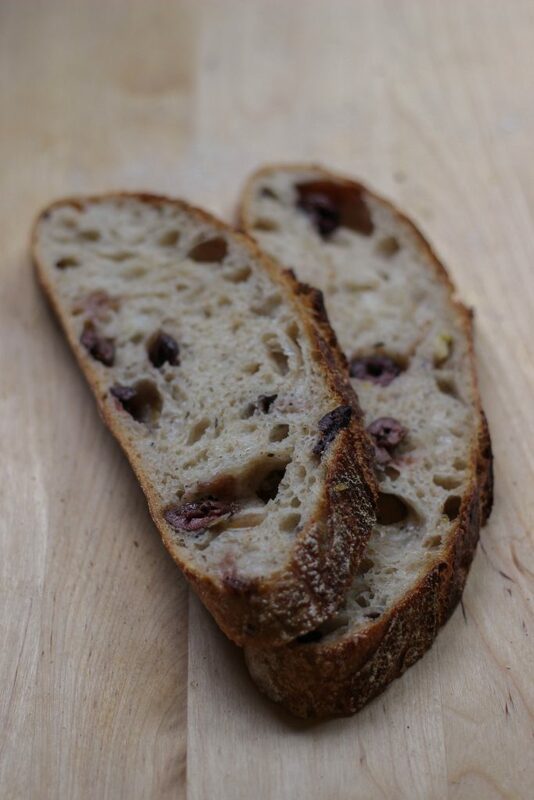 And then the salty olives. YUM. 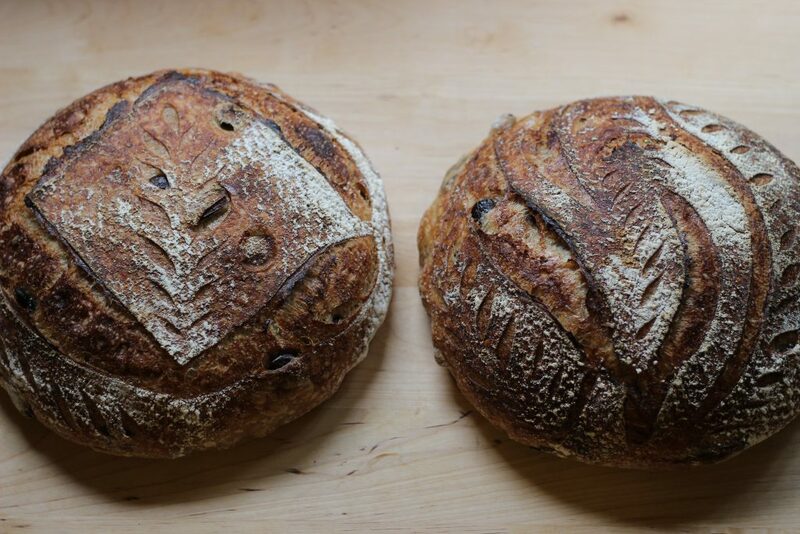 If you’re a bread baker, please do this. 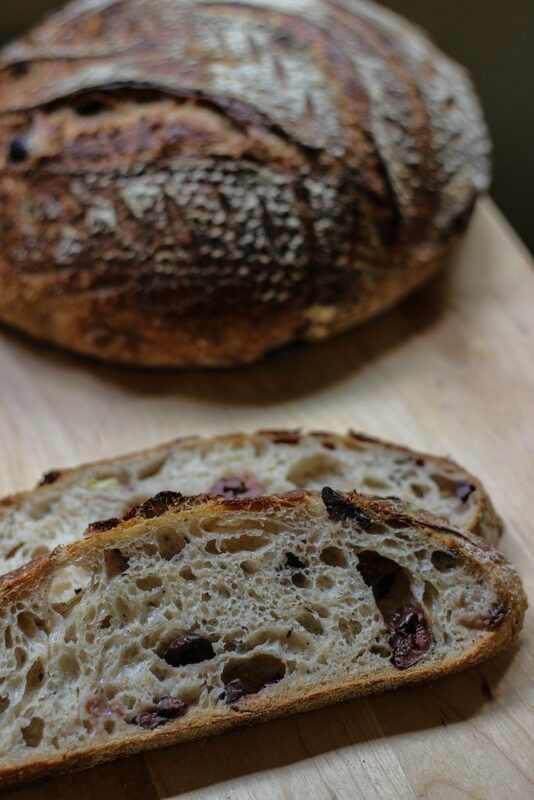 I’ve only posted one other sourdough bread on this little blog, even though I try to bake some at LEAST once a month. So I knew it was time for another fun post! It’s a 3 day process, so put on your patience pants and bear with me! I swear. Making your own bread is sooo worth it. And not as hard as it seems with some practice. I am an avid olive eater. I’ve always loved pretty much everything pickled, and kalamatas are easily one of my favorites. I also just happened to roast some bulbs of garlic earlier this week so I threw those in. And some lemon zest and herbs cuuuz I just love guilding those lilies, yeah? You with me? Yeah. Mix together in a small bowl, cover and store in a relatively warm place for the night. I typically stick it on top of my refrigerator. Check your levain by doing the float test to see if it’s ready! Stick a blob in a cup of room temp or slightly warm water. If it floats, it’s ready! 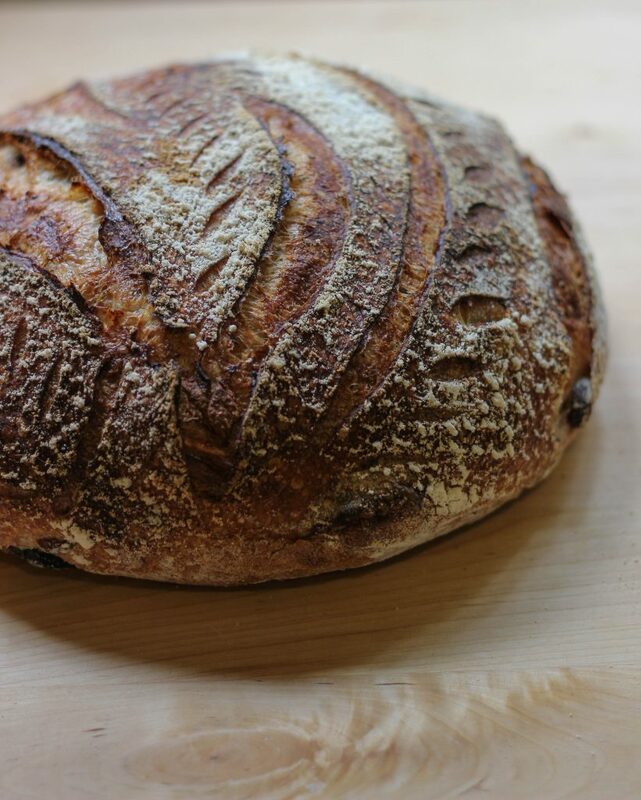 Mixing: Using a scale, weigh out your first water and add the levain. Mix until dissolved. Add your flours and mix with your hand until you have a shaggy dough. Cover, and allow to autolyse for 20-40 minutes. Sprinkle over the salt and extra 50 grams of water. Pinch the salt and water into the dough, and scrape down the sides of the bowl with a wet bowl scraper. 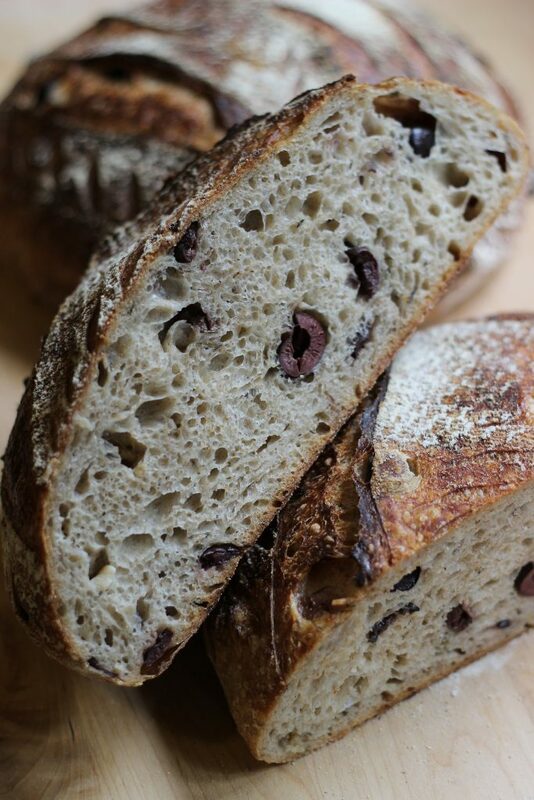 Bulk Fermentation: I find it very useful to read over the general dough developing process in the Tartine Bread book. They explain it very clearly. Essentially, you will do a series of 6 turns over 3-4 hours depending on the temperature of your room and dough. Typically I do the 6 in the first two hours (every half hour) and let my dough rest for an hour untouched before pre-shaping. After the first fold, mix in your add-ins! Shaping: When ready to pre-shape, turn out your dough on a lightly floured surface. Sprinkle the top of the blob with a little more flour, and divide into two. Pre-shape each into a semi tight round, cover with a dish towel and allow to rest for 20-30 minutes. Then shape your loaves and place them in floured baskets, bowls or bannetons! 😀 Mine go straight into the fridge for an overnight cold proof. Baking: Preheat your oven to 500 degrees and heat your dutch oven for at least 20 minutes. Cut 2 pieces of parchment into rounds, and grab your lame, some semolina or corn meal and a peel. Sprinkle the surface of your first loaf with semolina/corn meal (what will be the bottom), and turn out onto the parchment placed on the peel. 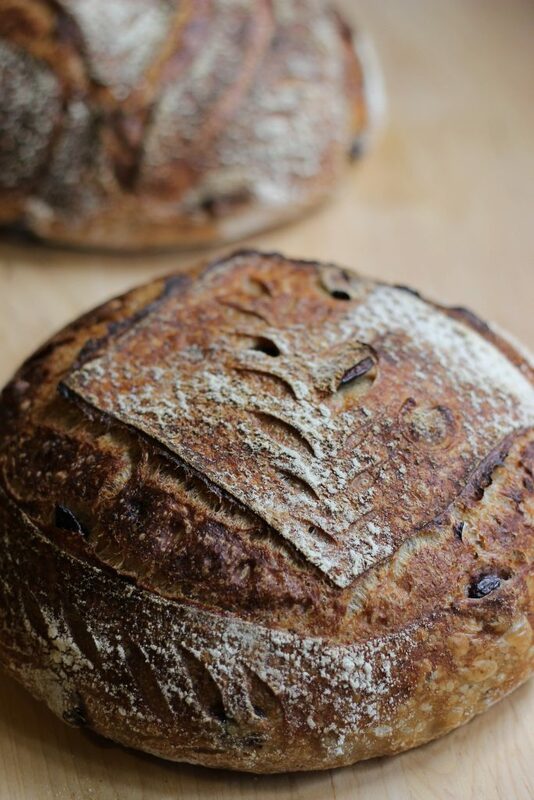 Score your loaf as desired, place into your dutch oven, lower the temp to 450 and bake for 20 minutes. Remove the lid, and bake for another 20-30 to desired color. Allow to cool on a rack before slicing. Bring the oven back up to 500, and reheat the dutch oven. Repeat the process with the second loaf. These loaves might be some of my best yet. I didn’t push the hydration, as I’m always tempted to do. I knew I didn’t wanna mess around on top of all those add-ins. 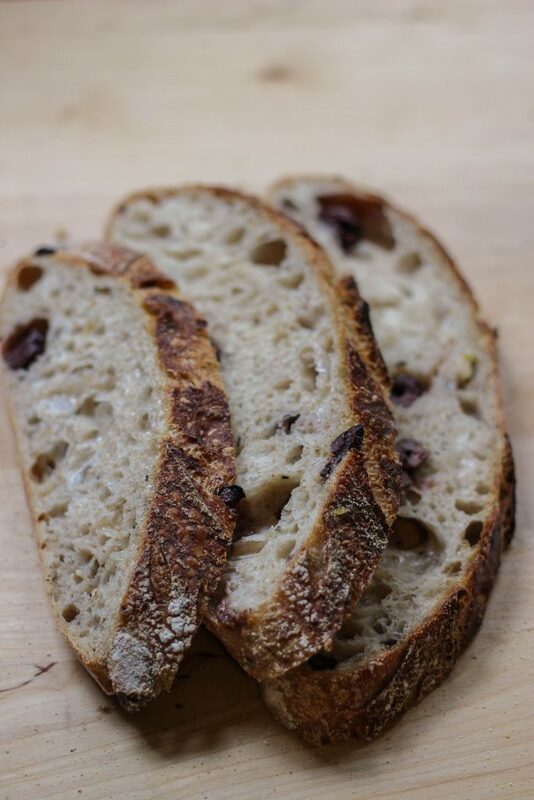 The crumb was perfectly tender and moist, the bits of olive and garlic are the perrrfect burst of flavor in each bite. I will never get over how satisfying each little step of baking sourdough is! 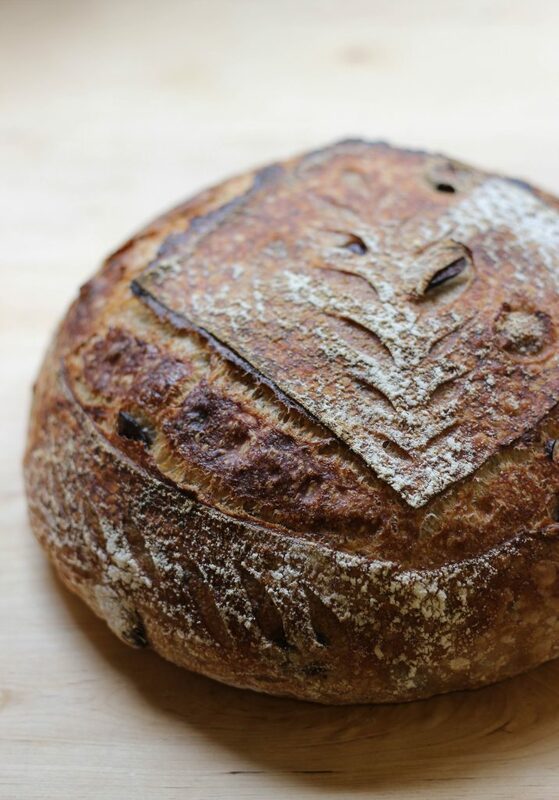 Developing the dough, getting the shaping down, scoring each loaf with your signature! That wonderful steam that bursts out when you remove the cover in the oven and you see the oven-spring. *Siiigh*. And you’re ALWAYS learning and adjusting. It is never boring adventuring with sourdough. Thank you Susan! 🙂 I will add myself to that group!! Thanks for reading.